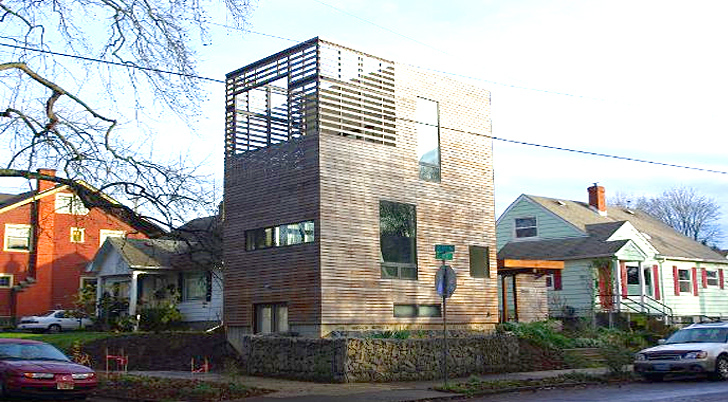 Portland's Harpoon House is a modern example of small-scale sustainability, compact living and prefab construction. Designed and built by homeowner and architect Matt Kirkpatrick of Design for Occupancy, the three story home expressly fits his and his partner, Katherine's, lifestyle. Everything necessary for a comfortable home is there, all efficiently packed into the 704 sq ft space. Built with structural insulated panels (SIPs), the home sits neatly on a small 50-by-50-foot corner lot leaving ample space for a working garden. This January, the home was awarded with LEED Platinum certification. When Matt and Katherine decided they wanted a home of their own they found a small lot in a southeast Portland neighborhood. 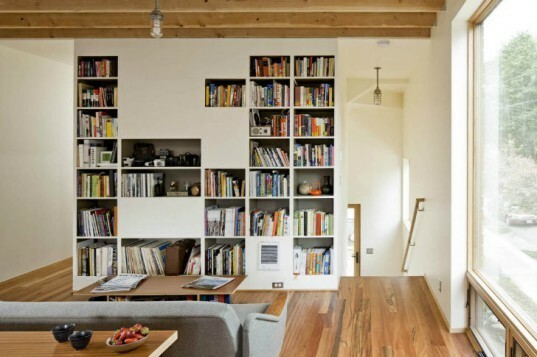 They had been living in a small house and didn’t want to increase their square footage, but instead to make it smarter. The home has a compact footprint with three stories. The bottom floor is an unfinished basement with a root cellar, with the first floor containing the kitchen, living and bathroom. The top floor holds the couple’s bedroom with a lofted bed over clothing storage and a sink. And a green roof off the bedroom provides a private outdoor living area. Storage is smartly designed into the home and many of the interior finishes serve double-duty purposes. Harpoon House was built out of prefabricated SIPs with a total size of 28 feet long by 28 feet tall and 16 feet wide. Tall ceilings and plenty of daylight help the home feel light and airy. The home also features triple-paned windows, FSC-certified hardwood floors, a heat pump water heater, and the green roof. With the home only taking up a small portion of their total site, there is plenty of space for a garden, which produces a lot of fruits and vegetables, much of which they store in their root cellar for winter. I'm surprised that was permitted - it's rudely blocking the light of the nearby houses. When Matt and Katherine wanted a home of their own they found a small lot in a southeast Portland neighborhood. The bottom floor is an unfinished basement with a root cellar, with the first floor containing the kitchen, living and bathroom. The top floor holds the couple's bedroom with a lofted bed over clothing storage and a sink. And a green roof off the bedroom provides a private outdoor living area. Storage is smartly designed into the home and many of the interior finishes serve double-duty purposes. Harpoon House was built out of prefabricated SIPs with a total size of 28 feet long by 28 feet tall and 16 feet wide. Tall ceilings and plenty of daylight help the home feel light and airy. The home also features triple-paned windows, FSC-certified hardwood floors, a heat pump water heater, and the green roof. With the home only taking up a small portion of their total site, there is plenty of space for a garden, which produces a lot of fruits and vegetables, much of which they store in their root cellar for winter. Construction of the home with SIPs. The Harpoon House in context of its Portland neighborhood.